Peter Jarema Funeral Home is a centennial funeral and cremation business serving nearly 63,000 residents of the East Village in Manhattan. The Brooklyn Bridge is located less than 3 miles from the facility, and New York City Marble Cemetery is a mere 1/2 mile from the site. Offering a comforting environment for families in need since 1906, Peter Jarema Funeral Home is housed in brick low-rise building. 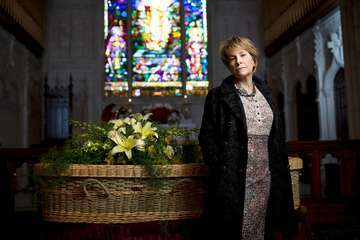 The funeral business is housed on the first floor of the structure and offers a beautiful, stain glass-windowed chapel. Limited street parking is available in front of the building. Robert Buzzetta took over as funeral director and owner of Peter Jarema Funeral Home in 1987, and he now works alongside Daniel, his son. Together they offer a variety of dignified services to their customers. The base offerings at this funeral home include direct cremation and immediate burial; however, there are also traditional funeral service packages and visitation options for cremation. Domestic and international shipping is available, as are pre-planning services. The prices below are based on the General Price List for Peter Jarema Funeral Home. However, funeral homes sometimes have special pricing packages available, and you should ask if those are available. Please let the funeral director know that you found Peter Jarema Funeral Home on Parting.com to allow us to continue helping families like yours. The General Price List we have on file for Peter Jarema Funeral Home has an effective date of Dec. 15, 2015. The prices on our site are for your reference only. We can’t guarantee that the actual prices will be the same as the prices listed on our site. All funeral homes have an effective date on their Price Lists that are subject to change and we recommend that you ask the funeral home for its most recent prices over the phone or for a copy of their General Price List. The funeral directors at Peter Jarema Funeral Home are available to provide you with expert advice.